Located in downtown Cleveland on Cleveland State Univerity’s campus, the 3-story, 100,000 sq. ft. signature building brings together dozens of learning classrooms where students from all medical disciplines can study and collaborate. 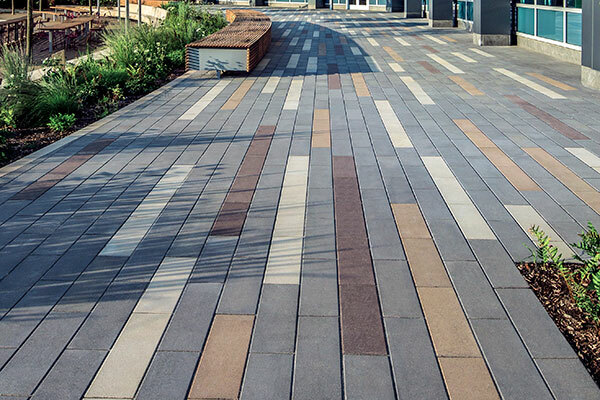 The landscape architect, Behnke Landscape Architecture chose pavers that would correspond well with the contemporary look, and set a precedent for future designs in the area. The 4” x 16” x 4” Promenade™ Plank Pavers was produced with the Senzo™ finish in Mediterano, creating a dynamic and vibrant space. In keeping with the desire to attain LEED Silver designation the pavers selected had a high reflective value to reduce the heat island effect and were installed with permeable spacers to return rainwater to the sub soil. The courtyard, conceived as a direct extension of the both the atrium and the South Gallery, now provides a beautiful, additional space for students to gather, study and relax.